New rules issued by the US government will mark the first step in supporting oil and gas production off of Alaska. Among them is the requirement that companies drill a relief well to contain an uncontrolled spill before ice sets in in the Arctic. Interior Department officials say the rules will govern exploratory drilling in the Beaufort and Chukchi seas off Alaska’s northern coast and were created because of the complicated climate, limited port infrastructure in the region and hunting needs of native communities. The Alaska region contains vast amounts of undiscovered, technically recoverable oil and gas. Estimates suggest there are 23.6 billion barrels of oil and 104.4 trillion cubic feet of gas. The area is rife with hazardous conditions, though. According to the Center for Biological Diversity, a group opposed to drilling in the Arctic Ocean because of threats to wildlife and the pristine ecology, the area is prone to hurricane storms, 20-foot swells and pervasive sea ice, frigid temperatures, heavy fog, and wind and seasonable darkness. The nearest Coast Guard is 1,000 miles away and there is no deep port close enough to handle the size of drilling containers and equipment. The rules are meant to ensure oil companies and their contractors are prepared for Arctic conditions and also implement a “region-specific” oil spill response plan, which requires quick access to equipment to contain a potential blowout and an available rig to drill a “relief well” to half oil from a blowout. “The proposed rule continues to allow for technological innovation, as long as the operator can demonstrate that the level of its safety and environmental performance satisfied the standards set forth in the proposed rule,” the Interior Department said. 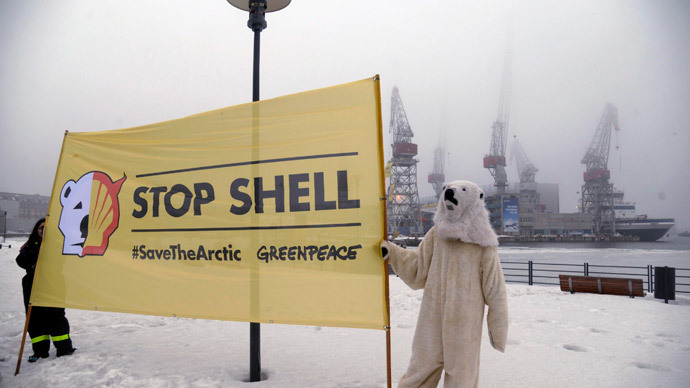 The draft rules come three years after Royal Dutch Shell suffered several accidents in the Arctic in 2012. At the time, Shell was granted permission to drill for oil in the Beaufort and Chukchi Seas and originally intended to drill 10 wells, starting operations with two drillings rigs called the Kulluk and the Noble Discoverer. Over the course of the year, the Noble Discoverer experienced several mishaps, nearly drifting ashore and forced to halt drilling just one day after it started due to sea ice. During a test of its oil spill containment system, the container was “crushed like a beer can,” and just a couple of months later the rig caught on fire. The Environmental Protection Agency fined Shell $1.1 million for violations of the Clean Air Act, since Noble Discoverer and the Kulluk’s engines released nitrogen oxide, ammonia and other pollutants in excess of what permits allowed. The EPA cited 23 violations of the air permits governing the Discoverer and 11 for the Kulluk. Shell plans to resume a scaled-back drilling program in Chukchi this summer before the new rules will be completed. “We will be holding them to the standards that we have held them to before, with upgrades and proof they and do what they say they do before they’re allowed to go there,” Interior Secretary Sally Jewell said, according to The Hill. Oil companies, including Shell and ConocoPhillips Co., lobbied the White House on the rules last year, telling officials that many of the regulations they’re considering would have little environmental or safety benefit but cost billions of dollars.